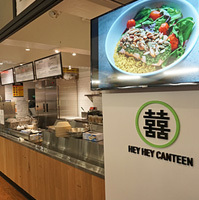 Hey Hey Canteen has landed at Turnstyle Underground Market near Columbus Circle. Kay Ch'ien, who was a partner in 2 Duck Goose in Gowanus, is leading the project with a focus on Asian comfort foods including several vegan and gluten-free options. The menu revolves around noodle bowls with a choice of rice, ramen or zucchini noodles. Flavors include Stir Fried Garlic, Sesame Peanut and Spicy Sichuan. Broths are also offered in winter months. Proteins range from lemongrass roasted chicken to pan-seared salmon and salt & pepper tofu. Bowls are dressed up with a selection of fresh vegetables that include Chinese broccoli shoots, enoki mushrooms, cucumbers, and carrots. It's then dusted with black & white sesame seeds. Steamed Pork & Chive Dumplings also make an appearance, along with vegetarian potstickers and chicken dumplings with garam masala. Hong Kong Fried Chicken gets a crispy ramen crust and served as a sandwich with green mango and radish pickles. Salads include a Chrysanthemum Caesar with almond parmesan and tofu-almond Caesar dressing (croutons optional). For dessert, there are bao bun donuts, called Baonuts, with cinnamon sugar and Nutella. Diners can order at the counter and grab a table nearby or get food to go.